The Turchetti Raptus was an Italian two seater sports car powered by a mid-mounted Alfa Romeo 2.0 liter Twin spark, 4 cylinder engine. The spaceframe chassis of the Turchetti Raptus was made from steel and chromium-molybdenum, and was covered by a lightweight body formed from fiberglass. For the fans of names like Stanguellini, Ermini, Paganelli, Giaur, Taraschi, Bandini, Stanga, Siata and a ton of others, this was to be a return to that beloved era. They were the representatives of an automobile era lost when in those days a small engine, a tubular frame, and experienced mechanical on a car in a jiffy, a small body that, thanks to a shockingly low weight and its engine and power racial, could win its class at the Mille Miglia. 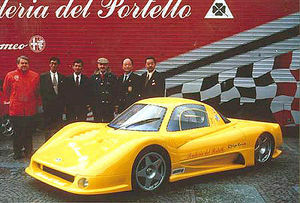 There was no manufacturing, there was no marketing for Turchetti, only loads of passion and skill.